Routine audiological assessments include pure-tone thresholds and assessment of the patient’s ability to perceive speech. The performance of speech audiometry materials is very important for determining how well a patient can hear speech. Our research was designed to determine if using different speech audiometry materials (male vs. female voice and 16 vs. 24 bit quantization) can influence the ability to understand the words being presented. We utilized a list of 43 spondaic (bisyllabic) words that were recorded using both female and make voices. All recordings were made in an anechoic chamber using talkers judged to possess a general American dialect. Each word was digitized several times using 44.1 kHz sampling rate and 24-bit quantization. The best production of each word was selected and each word was digitally edited to have the same intensity as a 1 kHz sinusoid used to calibrate the audiometer prior to each test session. Recordings using 16-bit quantization were constructed from the 24-bit recordings. This gave us four variables: male-16 bit, female-16 bit, male 24-bit and female 24-bit. The order of these four variables was randomly selected as well as the order the 43 words being presented. The words were presented at different intensity levels starting at 6 dB below their pure tone average (average thresholds at 500, 1000 and 2000 Hz) in the best ear. The lists were presented at 2 dB increments until all of the words were repeated correctly by 20 normally hearing participants. All participants possessed pure-tone thresholds 15 dB HL or better at all audiometric test frequencies from 125 through 8000 Hz. Each subject also had normal middle ear function and a negative history of ear disease. Results show that there were no clinically significant differences due to level of quantization or gender of talker. The difference in threshold (performance at 50%) among the various conditions was less than 2 dB which is clinically insignificant. Figure 1 presents psychometric functions for each of the 43 stimulus words (top 2 graphs) for the male and female talkers using 24-bit quantization (performance words quantized using 16-bits was similar to that obtained using 24-bits). Inspection of the psychometric functions for all 43 words reveals that there were several words which were outliers with regard to performance. In an attempt to improve homogeneity among test words with respect to threshold audibility and psychometric function slope the 27 words with the steepest slopes were selected for inclusion on the final test compact disc. 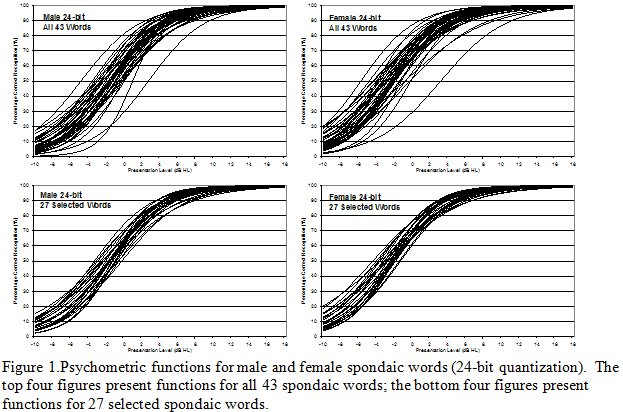 Figure 1 also presents the psychometric functions for these 27 selected spondaic words (bottom 2 graphs in Figure 1) for male and female talker recordings. Inspection of the psychometric functions for the 27 selected spondaic words reveals that performance is very similar for all words for both the male and the female talker recordings after eliminating the 16 outlier words. These final 27 spondaic words will be included on a test compact disc which can now be used to measure the Speech Reception Threshold (SRT) of patients during routine audiological assessments. Figure 2 presents the mean psychometric functions for the various experimental conditions. Inspection of Figure 2 confirms that there is little difference among the various experimental conditions. It is clear that either 16-bit or 24-bit recordings may be utilized clinically to measure the SRT. In addition, performance was almost identical for both the male and the female talker recordings for normally hearing participants. Future research should be conducted using individuals with varying degrees of hearing impairment to determine whether performance is the same in hearing impaired populations as it is for the normally hearing participants utilized in this investigation.